owadays all of the technological brands are involved in a fierce competition to produce something wider, thinner, slimmer, lighter and better. As DigitalMagnet always seeks the new, the most popular and worth-to-see products, for this video review we decided to run away from the conventional in terms of design and functionality. 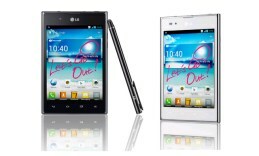 Dear tech fans, this is LG Optimus VU. I thought now nothing can surprise me as far as design and size are concerned but holding this smartphone in my hands proved me wrong. I bet you are already eager to know what’s so different here. As you can see, the device’s dimensions of 139.6 x 90.4 x 8.5mm almost resembles a square, which is a rare case in the smartphone category. The lightweight of only 168g is also very appealing. The chassis accommodates a wide HD-IPS LCD 16M color capacitive touchscreen of 5 inches. However, it creates the impression for being even bigger as it is a bit wider at the display ratio of 4:3. The resolution is 768×1024 pixels at the density of 256 points per inch – those numbers provide a pretty good viewing experience. You are also provided with a wide viewing angle and the bright screen allows easy exploitation when working under direct sunlight. Personally I like it when a few colors are available, so it was good news for me to know that for the case on the LG Optimus VU you can chose between three – black, white and pink, all combined with a chromed metal periphery line. It really creates an effective appearance and an impression for even slimmer design. The back of the headset is made of the flexible textured polycarbonate. Typically below the display, you will find four touch-sensitive hidden keys. The 1.3MP video-call camera is placed on the top left corner of the chassis and its quality cannot be missed even when viewing through the lens in Full Screen mode. The base camera on its part also provides good optics at 8MP and 3264×2448 pixel resolution. It features a number of function including face detection, image stabilization, and geo-tagging. It is equipped with a strong LED flash covering up to 4 meters and also available when shooting video at FullHD and 30 frames per second. There is a single speaker along the left back edge and its strength and quality are decent. The periphery features what is typical for most smartphones: there is a microUSB port also playing the role of a charing port, 3.5mm audio output, a power key and a two-sided volume controller. The wireless connectivity of the LG Optimus VU is provided by Bluetooth v3.0 combined with A2DP, IR port and the pretty recent and already common NFC technology. All I just mentioned is run by the dual-core Qualcomm MSM8660 Snapdragon chipset at 1.5GHz. The RAM on its part is 1GB. And for the graphic performance is responsible the Adreno 220 chipset. The software platform which supports all of this is Android 4.0 Ice-Cream Sandwich. The 7 hours of talk time on the LG Optimus VU are guaranteed by the Li-Ion 2080mAh battery.